Dacryocystorhinostomy (DCR) means creation of anastomosis for direct communication between the lacrimal sac and the nasal cavity through a bony ostium. There are different surgical techniques available for DCR. These include external DCR, endomechanical laser DCR, endonasal laser DCR, and transcanalicular laser-assisted DCR. Diode laser-assisted DCR offers many and specific advantages over conventional DCR. We present our experience with 23 patients who underwent transcanalicular laser-assisted DCR without stent at a single institution for a variety of indications. The first endoscopic DCR was attempted by Caldwell in 1893, whereas first transcanalicular/endocanalicular approach for DCR was described by Jack in 1963. External DCR has been a successful surgery in the treatment of nasolacrimal duct obstructions (NLDOs). However, time, bleeding, and scarring have always been issues. With the innovation of high-resolution fiber-optic endoscopes which yield high quality images, alternative techniques such as endolaser DCR which includes endonasal or endocanalicular/transcanalicular DCR are catching up fast because the success rate of such laser-based transcanalicular DCR (46% to 100%) and endonasal DCR (0% to 100%) is approaching that of external DCR > 90%. Transcanalicular laser-assisted DCR can be done under local anesthesia, involves precise cutting and removal of tissue by ablation, is bloodless, less time consuming, leaves no external scars, can be repeated, preserves ligaments and muscles of the internal canthus, and preserves lacrimal pump function. Over the years, lasers with different wavelengths have been used to perform osteotomy.,,, We opted for transcanalicular approach because of its better success rate and it allows direct application of the laser to the obstructed site, in spite of smaller osteotomy compared to endonasal approach. We present our experience of transcanalicular laser-assisted-DCR without intubation in 23 patients using 980 nm diode laser. The study was approved by the Ethics committee of the institution. This retrospective study included patients from January 2012 to December 2014. Twenty-three patients, 9 males and 14 females, were treated with transcanalicular laser-assisted DCR without intubation for NLDO. The inclusion criteria included primary NLDO and failed lacrimal sac surgery. The exclusion criteria included acute dacryocystitis, mucocele, common canalicular obstruction, previous trauma with disfigurement, nasal polyps, and gross nasal septal deviation. Endoscopic examination was performed by otolaryngologist on all patients before surgery. All patients had preoperative irrigation of the lacrimal pathways and imaging (wherever deemed necessary) to determine the exact level of obstruction and to evaluate bone thickness. Slit-lamp examination was done to rule out epiphora-related disorders such as ectropion, entropion, blepharitis, and lagophthalmos. Diode laser (980 nm infrared) using fiber-optic cable was used because it offers high absorption in water and oxyhemoglobin, achieves optical coagulation with very efficient vaporization of bone and soft tissue, and ensures almost bloodless surgery. The laser settings included optical power of maximum 5 watts with aiming beam of 635 nm, pulse length 90 ms, and interpulse pause of 50 ms. The interior of nasal cavity was visualized with the help of the nasal endoscope on a monitor. All patients were operated under local anesthesia (lignocaine with epinephrine) with sedation, discharged same day on Tobradex eye drops and mometasone nasal spray. Success of the procedure was assessed by the patency of the lacrimal passage on irrigation with normal saline. The nasal mucosa was anesthetized by gauze pack soaked with solution of lignocaine with adrenaline (1:100,000). Adequate dilatation of the lower punctum was done with punctal dilator for facilitating passage of the fiber-optic probe. Intracanalicular endoscope was used to examine the lacrimal canaliculi and the lacrimal sac. The exact site of osteotomy was determined using two endoscopes: one intracanalicular which highlighted the lateral nasal wall from the side of sac and second nasal endoscope which determined the middle nasal meatus. Site just anterior and inferior to the attachment of the middle concha was selected for osteotomy. The laser probe was inserted horizontally into the sac through the lower punctum and then turned vertically downward, medially and backward (same as in probing) till it was vertical. Then, the probe was pushed till a hard resistance was felt. A 0° rigid camera-mounted nasal endoscope was used to visualize the laser beam. The laser beam was properly focused in the inferior meatus. A contact continuous mode diode laser 980 nm was used to create osteotomy. Laser light was delivered through 0.5 mm optic fiber with 0.36 mm core. The osteotomy was enlarged to 5 mm by pulling up and then pushing down the laser probe in a see-saw movement. No intubation with silicone stent was done. There was no postoperative nasal pack. Syringing was carried out after creating an adequate opening. Follow-up examinations were at 1 week, 4 weeks, 3 months, 6 months, and 1 year after surgery. The average procedure time was 15 min (range: 10–25 min), and an average total amount of delivered laser energy was 255 j (range: 200–700 J) to create a 5 mm wide osteotomy. Our parameters of patency were divided into objective (successful irrigation of the lacrimal passages) and subjective (absence of tearing and discharge [Table 1]). 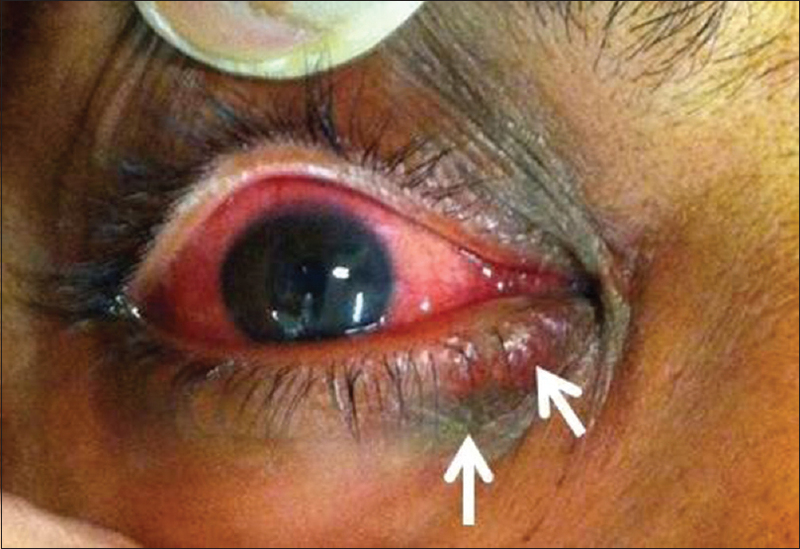 One patient had laser-induced pericanalicular inflammation and burns [Figure 1]. It was managed with topical erythromycin cream over the wound for 1 week and resolved completely. Creation of anastomosis for direct communication between the lacrimal sac and the nasal cavity through a bony ostium has been the main objective of relieving NLDO since the inception of external DCR. With time, science has made tremendous advances in the form of technology, techniques, and instrumentations. Scientific technology gave us better lasers, techniques gave us bloodless, scarless, and smaller fields of surgery, and instrumentation gave us excellent intra- and post-operative results. Long-term success rates of transcanalicular laser-assisted DCR may be low compared to external DCR, but its many advantages cannot be ignored. Since we have started transcanalicular laser-assisted DCR recently, we do expect difference in success rates compared to established centers elsewhere. Different success rates have been reported with transcanalicular laser-assisted DCR, ranging from 59% to 92%. The success rate in our study was 60.8% which is acceptable and logical. We attribute the difference to experience of surgeons, size of ostium openings, and most important our patients did not have intubation/stent at the end of surgery. We followed up our results in literature and found our success rate of 60.8% close to 70%–80% by Olver and Mandeville and Woog., Our results (60.8%) are supported by Maini et al., who in a randomized clinical trial found 68% success rate in endolaser DCR at 12-month follow-up. Recent studies have reported success rate in transcanalicular laser-assisted DCR ranging from 73.3% to 94.2% (with intubations). However, none of these studies have commented on other outcome parameters such as symptoms' improvement which in our series was 69.6%. We could not achieve success rate this high in our patients with diode laser due to different inclusion/exclusion criteria, nonuse of stent, and laser physics. New techniques and modifications such as the use of mitomycin C intraoperatively in laser-DCR are likely to increase the success rate. Transcanalicular laser-assisted DCR, a new contribution to endoscopic surgery, is a viable treatment option for nasolacrimal duct obstruction with an exciting success rate. This is the first report from Oman, and to the best of our knowledge, first report from Middle East. We expect better results in our current patients in whom transcanalicular laser-assisted DCR is combined with intubation. Plaza G, Beteré F, Nogueira A. Transcanalicular dacryocystorhinostomy with diode laser: Long-term results. Ophthal Plast Reconstr Surg 2007;23:179-82. Mahmood S, Sadiq A. A short history of lacrimal surgery. CME J Ophthalmol 2001;5:76-8. Jack MK. Dacryocystorhinostomy. Description of a transcanalicular method. Am J Ophthalmol 1963;56:974-7. Yung MW, Hardman-Lea S. Analysis of the results of surgical endoscopic dacryocystorhinostomy: Effect of the level of obstruction. Br J Ophthalmol 2002;86:792-4. Dalez D, Lemagne JM. Transcanalicular dacryocystorhinostomy by pulse holmium-YAG laser. Bull Soc Belge Ophtalmol 1996;263:139-40. Piaton JM, Limon S, Ounnas N, Keller P. Transcanalicular endodacryocystorhinostomy using neodymium: YAG laser. J Fr Ophtalmol 1994;17:555-67. Emmerich KH, Lüchtenberg M, Meyer-Rüsenberg HW, Steinhauer J. Dacryoendoscopy and laser dacryoplasty: Technique and results. Klin Monbl Augenheilkd 1997;211:375-9. Eloy P, Trussart C, Jouzdani E, Collet S, Rombaux P, Bertrand B, et al. Transcanalicular diode laser assisted dacryocystorhinostomy. Acta Otorhinolaryngol Belg 2000;54:157-63. Olver J. Colour Atlas of Lacrimal Surgery. Oxford: Butterworth-Heinemann; 2002. p. 98-9. Mandeville JT, Woog JJ. Obstruction of the lacrimal drainage system. Curr Opin Ophthalmol 2002;13:303-9. Maini S, Raghava N, Youngs R, Evans K, Trivedi S, Foy C, et al. Endoscopic endonasal laser versus endonasal surgical dacryocystorhinostomy for epiphora due to nasolacrimal duct obstruction: Prospective, randomised, controlled trial. J Laryngol Otol 2007;121:1170-6. Drnovsek-Olup B, Beltram M. Transcanalicular diode laser-assisted dacryocystorhinostomy. Indian J Ophthalmol 2010;58:213-7. Yazici B, Yazici Z. Final nasolacrimal ostium after external dacryocystorhinostomy. Arch Ophthalmol 2003;121:76-80. Melike BY, Tolga Y, Umit T, Muhittin T, Mehmet A, Faruk OM, et al. Prospective comparision of 3 dacryocystorhinostomy surgeries: External versus endoscopic versus transcanalicular multimode laser. Ophthalmic Plast Reconstr Surg 2015;31:13-8. Liao SL, Kao SC, Tseng JH, Chen MS, Hou PK. Results of intraoperative mitomycin C application in dacryocystorhinostomy. Br J Ophthalmol 2000;84:903-6.